We've heard a lot of chatter about the coming army of Android tablets, but we haven't seen any real contenders posing a challenge to Apple's dominant iPad--until now. Samsung first unveiled the Galaxy Tab at the IFA show in Berlin earlier this month; now, the company has formally introduced the Tab to the U.S. market for all four major wireless carriers (AT&T, Sprint, T-Mobile, and Verizon). And judging from my initial hands-on with a preproduction Samsung Galaxy Tab, this tablet has the chops to compete with the iPad. The carriers each already offer a custom branding of Samsung's Galaxy S family of smartphones. For the Galaxy Tab, Samsung said that it was leaving the pricing and availability announcements to each carrier--and right on cue, all four carriers have issued announcements about their respective devices. So far, none appear to have applied a unique name to the product, referring only to the Samsung Galaxy Tab. None of the carriers discuss pricing or service-plan options in their announcements, either, nor do they discuss availability beyond broad strokes: "holiday" (T-Mobile), "the coming weeks" (Verizon), "the coming months" (AT&T), and "this fall" (Sprint). In their respective announcements, AT&T, Sprint, and Verizon each discuss a few of the customizations they'll make for their customers, but details are sparse. AT&T mentions that the AT&T Connection Manager will automatically connect to AT&T Wi-Fi Hot Spots. Sprint says the Galaxy Tab will have mobile hotspot capability for up to five Wi-Fi devices. Verizon's release also mentions mobile hotspot support, and the company is the only one to talk about the tablet's exclusive software tie-ins with its service: You'll find V Cast Music with Rhapsody, V Cast Video on Demand, V Cast Song ID, VZ Navigator, and the games Let's Golf and N.O.V.A. all preinstalled on the Verizon version of the Tab. The first thing that jumps out about the Galaxy Tab is its manageable size. Not surprisingly, the front face is all screen, with four capacitive touch-sensitive buttons running along the bottom (or the left side, if you hold the device in landscape orientation). With a 7-inch display and a weight of 0.8 pound, the Galaxy Tab is small enough to fit into some tight spaces (such as a roomy pocket), light enough to hold with one hand, and large enough to provide satisfying viewing. I found the Galaxy Tab comfy to hold in one hand, unlike the Apple iPad, which at 1.5 pounds is just too heavy to grasp with a single hand for any length of time. The dimensions and weight allow you to hold the Tab and type on it with your thumbs at the same time, using two hands or even one hand. Users with smaller hands will have to stretch to type one-handed; for larger hands, the arrangement is no problem. The keyboard seemed decent overall, though I didn't pound on it enough to pass final judgment on its usability. Clearly influenced by Samsung's Galaxy S line of phones, the Galaxy Tab appears notably more stylish and less clunky than some of the early, off-brand Android tablets we've seen pop up across the Web. It does stand at a half-inch thick, the same as Apple's iPad; admittedly, though, in this comparison the latter benefits from rounding conventions, as the iPad measures 13.4mm to the Tab's 13mm. The wide, Super VGA, 1024-by-600-pixel TFT display appeared bright and viewable at an angle, but I did not get a chance to test the display in bright sunlight. Samsung claims that its display has a better viewing angle and contrast ratio than the higher-resolution iPad screen; however, I did not test the two side-by-side. It has two cameras--a rear-facing 3.2-megapixel camera and a front-facing 1.3-megapixel camera--and a camcorder for video chat. In our limited environment, the back-facing camera seemed to be of passable quality, but we need to get the final version of the Tab out into the wild to truly put it through its paces. The same goes for the front-facing camera, which I did not try on the unit I handled. The device has very little else on it physically, aside from volume-up and -down controls and a power button. It has a proprietary charger port; like the iPad, the Tab requires more juice than is available solely over USB. If you plug the Tab into a computer's USB port, you'll get a trickle charge, but not a full charge as you would with a phone. The 4000-mAh battery provides 7 hours of video, according to Samsung. Inside, the Galaxy Tab has Samsung's 1GHz Hummingbird Application processor, two SIM slots, a 3G radio for data connections, Wi-Fi and DLNA support, 16GB of memory on-board, and one MicroSD slot for expanding memory to up to 32GB. 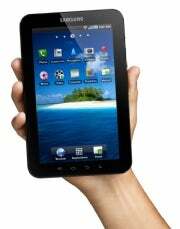 The Tab runs Android 2.2, supports Adobe Flash 10.1 and Microsoft's PlayReady DRM, and features a tablet-optimized version of TouchWiz 3.0, the Samsung interface found on the company's Galaxy S smartphones. Like the Galaxy S phones, the Tab has Swype for faster typing; Samsung's Social Hub for aggregating your messages across e-mail, text, and social networks; and Media Hub installed for accessing television shows and movies for download and rental. The new Media Hub lets you share a Media Hub account among up to five Galaxy devices, although at this time you can't start watching something on one device and then return to the same place and resume viewing on another. That capability is in place for e-reader software such as Amazon's Kindle apps; if Samsung can establish something comparable for Media Hub, that could give it a competitive advantage over Apple's iTunes. Samsung has wisely spent a fair amount of time optimizing Android for the large tablet screen, something that's definitely in evidence on the Galaxy Tab. The company has redesigned the memo functions, e-mail, file-management system, calendar, contacts, music player, video player, and messaging apps to take full advantage of the extra screen real estate. E-mail, for example, presents a very iPad-esque dual-pane view in landscape mode that shows both the open message and your various inboxes. Samsung has slightly tweaked the Android Desktop, too: A sliding tray of icons (browser, apps, e-mail, and the like) runs along the bottom of the display, while widgets occupy the middle expanse of the screen and an enhanced status bar runs along the top. Above that is the Android-standard notifications bar, which you can drag down with your finger as on any Android device. The ability to pinch to view all of your multiple home screens--a feature not available on the phone series--is available here, too. Adding fuel to the debate over what exactly defines an e-reader, the Tab comes with three e-reader apps preinstalled: PressDisplay for news, Kobo for e-books, and Zinio for magazines. Of course, you can download any Android e-reader app for use with the Tab, as well; the only question is whether the app you choose has been designed in a way that works with tablets. The Tab carries the Google-certified logo, and has the Google Android Market on-board. Samsung says the 80,000-plus apps in the Android Market will work on the device, although only a small number of those are actually optimized for the Tab's roomy screen size and resolution. Apps that aren't optimized, according to Samsung, will appear centered in the screen at 800 by 400 resolution, which may help explain why I had the initial impression that unscaled apps looked better here on the Tab than unscaled apps on the iPad do. Although the Tab is clearly focused on delivering entertainment, Samsung hasn't forgotten the device's productivity potential. Preinstalled on the Tab is a Microsoft Document Viewer and Editor, which allows you to open and make changes to any Word, Excel, PowerPoint, or PDF document. With the introduction of the Media Hub movie and TV service, Samsung offers a one-two-punch that squarely positions its Galaxy series of smartphones and tablets as mobile entertainment centers. (Even though the company has just one tablet today, it's not a stretch to imagine future products in the line, at different screen sizes.) The Galaxy Tab looks and feels very promising; we look forward to seeing the actual shipping products that each carrier offers, as well as their prices. Cost, in particular, will help determine whether the Galaxy Tab family sinks or swims.